The 20 MW Arnprior solar power project-one of the largest solar power projects in North America-recently came on-line in the Canadian province of Ontario, and there's more solar power to come in the province thanks to a new feed-in-tariff program. Grid-tied photovoltaic solar power generation in the Canadian province of Ontario has jumped to 50 megawatts from 2 megawatts in just one year. Much of that growth can be attributed to Canada's largest PV installation-the Arnprior Project-that came online with nearly 20 MW this past December. Jon Kieran, director of solar power for EDF EN Canada, the firm that developed Arnprior, credits the Ontario provincial government for its feed-in-tariff program that helps spur PV development. "We think the government of Ontario is a real visionary in North America," says Kieran, who is based in Toronto. "The government created a fixed guaranteed price, and developers get paid the price for every unit they're able to generate. The builder and developer take on the risk of making the investment. "In Ontario, and in most European countries, they deploy the solution where the problem is. And it is creating an incentive for members of the industry willing to take investment risks." 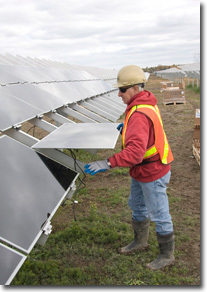 EDF EN Canada and its parent company, the Paris-based EDF Energies Nouvelles, began exploring the possibility of building large-scale PV generation systems in 2007, after the Ontario government unveiled its Renewable Energy Standard Offer Program (RESOP) in November 2006. Under that program, the Ontario Power Authority agreed to pay solar generators 42 cents (Canadian) per kilowatt hour for 20 years. RESOP has ended and has been replaced with FIT, or Feed-In-Tariff. The more recent program has more qualifying criteria, such as minimum amounts of locally sourced materials. Before construction could begin on the Arnprior project, Kieran says EDF EN Canada had to complete three tasks. First, it had to assemble land on which to build the PV generation system. It did so by acquiring two adjacent parcels that comprise a total of 200 acres near Arnprior in West Carleton, an agricultural community on the western outskirts of Ottawa, Canada's capital city. For projects to qualify under RESOP, they had to be 10 MW (AC) or less. Because of that, Arnprior actually was developed as two separate but adjacent projects for total production of 23.4 MW (DC), or slightly less than 20 MW (AC). The company also had to secure commercial contracts through the RESOP program, and it had to reserve a position in the distribution system. Those tasks were completed in 2008 by enXco, EDF EN's North American affiliate. Then came the daunting task of finding financing in the down economy. "It was definitely a challenge to assemble a financing plan for Arnprior in early 2009 when we were making a commitment to build the project," Kieran says. "We were able to use the track record of EDF EN and the considerable expertise of staff at enXco. We were able to generate interest among banks to take a serious look at the Arnprior project-even in a pretty demanding project financing environment." In the end, the financing was split between the European lender Dexia and California-based Union Bank N.A. 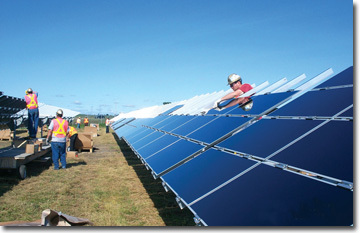 Construction began in June 2009 on the Arnprior solar project, with an aggressive schedule calling for completion by December. EDF EN Canada chose M. Sullivan & Sons Ltd. as the general contractor because of the firm's construction experience and commitment to bringing projects in on time and on budget. Construction began in June 2009 with an aggressive schedule, for completion by December. Kieran says EDF EN Canada chose M. Sullivan & Sons Ltd. as the general contractor because of the firm's construction experience and commitment to bringing projects in on time and on budget. "It's not a stretch for any competent, qualified construction company to build a solar power plant," Kieran says. "What's important is that they have that specific balance of civil, mechanical, and electrical capability and can bring it all together-and have an understanding of the project schedule to build it in the construction season that we live with in Ontario." Tom Hughes, who was the Arnprior project manager at Sullivan & Sons, says the project wasn't as difficult as people believe-it was just large. Sullivan & Sons, a family-owned general contractor based in Arnprior, has been in business since 1914. And the firm is experienced in handling large commercial projects, he says. "I'm a master electrician and have worked for a general contracting firm for 25 years doing industrial and large-scale commercial jobs. So this was just another large electrical project," Hughes says. The real challenge was finding the necessary skilled labor. At the peak, the project employed more than 150 workers. "A lot of the local unions are in full employment-there's no recession up here in Ottawa," Hughes says. "We had electricians coming from the east coast of Canada to work on the project and from southern Ontario, where the work situation is a little slower than in the Ottawa area." Much of the design and engineering was completed using the expertise within EDF EN Canada and enXco, Kieran says. Among the issues that had to be addressed were the notoriously unstable clay soils of the area, wind load, and snow drifts. To address clay soils on the 200 acre site, the Arnprior project was constructed with pilings that had auger-like tips, which were basically screwed into the soil. A rack that holds six columns by four rows of PV panels was mounted on to every set of two pilings. To address the clay soils, the Arnprior project was constructed with pilings that had auger-like tips, which were basically screwed into the soil. Sullivan & Sons turned to Almita Manufacturing Inc. of Ponoka, Alberta, Canada, to design, fabricate, manufacture, and install the screw pilings. Almita turned out 2,400 helical piles per week for a total of 26,000 for the project. The firm also assembled a crew of 25 workers and five specialized pile installation rigs for the job. They installed more than 350 piles per day and finished 17 days ahead of schedule. Racks that hold six columns by four rows of PV panels were mounted to every set of two pilings. The developers mulled whether to go with a fixed-mount or tracking system and ended up favoring the fixed mount. "We were dealing with the economics relative to what the RESOP program was offering and the timing and availability of panels," Kieran says. "We felt that fixed-mount was the appropriate selection compared with the economics of a tracking system." EDF EN Canada selected the FS275 75-watt thin-film panel from First Solar of Tempe, Arizona. Together, the two installations comprise 312,000 panels on 13,000 racks. "For this application, and at this time, these panels worked best," Kieran says. "For the climatic conditions, the site geography, the commercial conditions, and the production issues-we balanced multiple considerations to determine the optimal panel option." The panels and mounting brackets also had to withstand the extreme climatic conditions that Ontario sometimes experiences. Although not the norm, the mercury can dip as low as minus 40 degrees Celsius and rise as high as 40 C, Kieran says. Humidity and strong winds also had to be factored in. The brackets and mounts were manufactured by Northern States Metals of Youngstown, Ohio which Hughes says did a "fantastic job." "The manufacturer met the delivery schedules flawlessly," he says. Because the thin-film panels have no frames to catch snow, snow loading wasn't as much of a concern as with framed panels, Kieran says. To mitigate drifting snow that can accumulate along the bottom row, the panels sit more than one meter off the ground. Kieran says trucking that amount of material to the site proved to be a logistical challenge. "That represented hundreds, not dozens, of truck trailers. You had to manage that, and at the same time, ensure a positive relationship with the community," he says. More than 200 trucks were needed to deliver the panels, Hughes says. Delivering the racking took another 100 trucks. "Everything had to be set up so that a certain product had to be delivered on certain days," he says. "It's a farming community, so people are used to equipment running down the road. We staged it so we had trucks delivering glass one day and no more than four or five per day and staggered them. "When you stage your deliveries properly, nobody gets too upset about the amount of trucks driving up and down the roads." Their efforts didn't go unnoticed. "I believe the community and municipal council appreciated the efforts we made. We intend to be the owner for the next 20 years-and we're determined to be a good neighbor," Kieran says. Technically, you can build year-round in Ontario. Realistically, Kieran says, you don't want to be trying to install glass panels on icy surfaces in the dead of winter. "Racking and installation is a preferred warm-weather activity compared to doing that in January and February, when it's extremely icy and cold." Construction began in June, a time of year that typically is dry and favorable. But Hughes says record rainfall during the summer and fall created some hardships. "The whole project is outside without umbrellas," he says. Nevertheless, they brought it in on time. Both projects A and B have Xantrex and Schneider Electric 1 MW PV Box Solar Power Conservation Substations. Each substation is made up of two Xantrex GT500 inverters, system monitoring, security, and lighting. The power from each site then goes into a 44-kilovolt feeder line to the Hydro One distribution grid. The project came online in December 2009 as scheduled, and Kieran says EDF EN Canada is "100 percent pleased" with how the two systems are operating. EDF EN Canada continues as the owner, and enXco Service Corp. is responsible for operations and maintenance.